As financial planning continues to grow, it becomes more and more competitive, and increasingly difficult for firms to differentiate themselves. As a result, firms slow their growth rates, and some struggle to survive or grow at all. While most firms work harder and harder to make marginal improvements in their process, service, and value, to differentiate themselves from their competition, there is an alternative available: to seek to completely redefine the financial planning value proposition, letting go of things that are no longer truly important, and instead focusing on creating value that will make financial planning relevant to new audiences. And as financial planning enters the digital age, there is perhaps more opportunity than ever to begin doing things in a completely different – and better – way. So if you could rewrite the financial planning value proposition from scratch, would you still be doing it exactly the way that you do? Or is the reality that by letting go of “the way things have always been done” we could recreate a financial planning offering that would reach more people than ever? The inspiration for today’s blog post is a book I read last year called Blue Ocean Strategy by W. Chan Kim and Renee Mauborgne. The basic principle of Blue Ocean Strategy is relatively straightforward – instead of competing in the bloody red oceans of the current marketplace where competition is fierce, strive to steer your business to a wide open blue ocean that has no competition. How do you get to a blue ocean of competition? Through value innovation – the simultaneous pursuit of differentiation and low cost. So what does Blue Ocean Strategy look like in more practical terms? An example would be Cirque du Soleil, an organization that managed to successfully innovate and compete in what was previously the declining “circus” industry. How did Cirque du Soleil do it? By re-defining value in the circus – for instance, by targeting adults instead of children, and making it more like a theater experience, while retaining the lower cost aspects like basic, plain seats, and a show that has no big-name (and expensive) “star” draws. The end result is an experience that is not quite circus, nor theater… and that’s the point. Cirque du Soleil succeeded by not competing with the red oceans of circuses or theaters directly, but by creating its own new blue ocean. Another example of Blue Ocean Strategy would be Southwest Airlines, which entered a brutally bloody red ocean existing airline industry that was struggling to even be economically viable. Southwest redefined their marketplace by eliminating what they viewed as unnecessary – from air route hubs to seating choices to lounges and meals – and focusing on what was appealing to attract people who were currently non-customers, such as by making departure times so frequent and flights so inexpensive that people who take short family trips by car would consider flying Southwest instead. As the authors note, the key to finding a Blue Ocean is to look at the values delivered by traditional competitors, and the values that consumers want – including, and perhaps especially, those non-customers who currently do not even engage in the industry – and in the process, re-draw the value curve focusing on low cost where possible and high value differentiation where it matters. 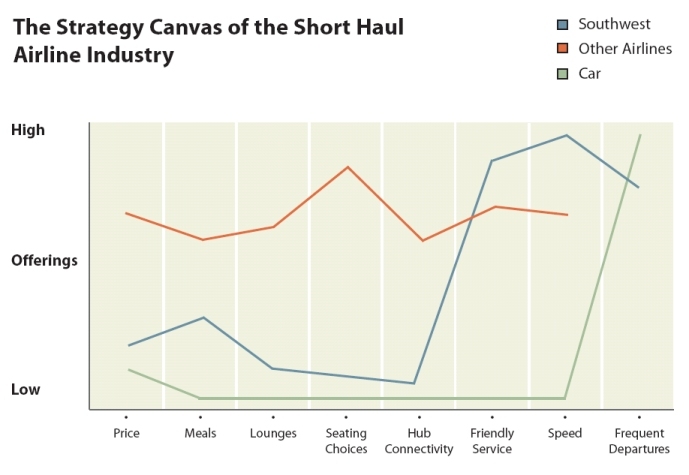 Below is an example of the value curve for Southwest compared to other airlines, and the alternative of traveling by car. A similar example from the financial services industry might be the rise of Charles Schwab, who devastated the traditional brokerage model with a focus on low cost and differentiation. Schwab made their competition irrelevant by aggressively pursuing low cost – for instance, by eliminating expensive brokerage commissions, making their trading systems more efficient – while simultaneously differentiating themselves with online trading tools that opened up stock investing to a group of non-customers – the so-called “do it yourselfers” who previously did not engage the financial services industry at all. The end result was a company with explosive growth, not just because they took customers away from their competition (people who invested with brokers), but because they attracted customers who weren’t even prospects up until that point (do-it-yourselfers)! In turn, this raises the question – what is it that we do in financial planning that we believe delivers value, but in reality just increases cost with limited benefit? For Southwest, the Blue Ocean meant letting go of traditional “requirements” in the airline industry that were actually high cost but limited consumer value, from serving meals on flights to offering lounges to providing predetermined seating assignments. In financial planning, what high cost items might we eliminate? The labor-intensive construction of the written financial plan? Regular in-person meetings that require a substantial time commitment of both planner and client? And what can we deliver that is genuinely valuable to an audience who previously has not engaged in financial planning at all? So what do you think? How would you answer the questions above – what do you think could be eliminated, reduced, raised, and created? How would you draw the value canvas for financial planning as a business? What could we change to open up an entirely new marketplace for future financial planning consumers?